Xbox 360 Accounts Being Hacked - Change your Account Password Immediately! Knowing that a lot of 3Gstore customers utilize their wireless modem with a 3G/4G router for gaming, we wanted to give you a security warning. There have been a lot of reports over the past day of Xbox 360 accounts being hacked and user accounts being locked. A thread over at Neogaf has already had seven users reporting their accounts have been hacked or suspended so far. We've also confirmed on other forums that users have been reporting stolen accounts within the past day. We advise you to take action immediately and change your password to a 12 character minimum featuring both numbers and letters. More details available here - Xbox 360 Accounts Being Hacked - Change your Account Password Immediately! 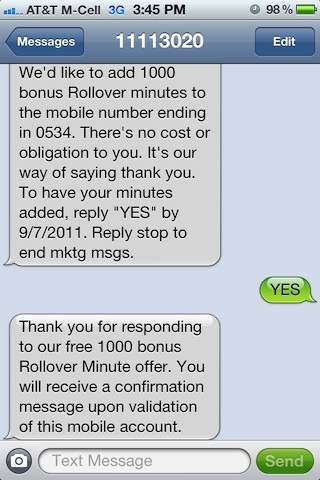 Usually before a new iPhone comes out, AT&T gives our "bonus rollover minutes" to existing customers and it looks like it started yesterday. 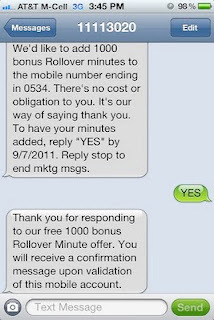 Did you get the free 1000 minute offer? Pepwave recently announced the Pepwave Max 700 Load Balancing & Bonding Router and we have just published our review (including video tutorial). There are a wide variety of consumer-grade routers on the market, but this router is in a class all by itself. Check out our review, download the Max 700 Spec Sheet and even schedule a live Max 700 demo. The United States Geological Survey’s (USGS) announced a 5.9 Magnitude earthquake that hit Virgina around 1:51 PM EST working its way up the east coast. According to On Deadline, "tremors were felt as far south as North Carolina, as far north as Buffalo and Boston, and as far west as Detroit." This has resulted in several city evacuations and closures up and down the Eastern seaboard and placed a strain on the wireless networks. Users in Manhattan, Washington D.C., and other areas are reporting that the earthquake is jamming cellphone networks. If you have a need for increased speeds (upload and download) when in a 3G area (or 4G) or you need a reliable way to bond connections from multiple carriers, so that you connection is more stable, we can help. We are putting together demonstration videos now and if you would like an early demo, just contact us and one of our 3G Bonding experts will be glad to help you. At 3Gstore, we have been big fans of the Peplink family of load balancing routers thanks to their advanced enterprise features such as bandwidth monitoring, site to site VPN functionality, and super-fast failover. Peplink has recently announced an update to two more of their routers, the Balance 310 and Balance 210, that adds a USB port for 3G and 4G modems (previously, the 310 and 210 were for use with wired WAN connections only) and improves throughput. Peplink also updated their compatibility list for the entire Balance series of routers to include the Sprint 3G/4G U600 and 250U modems as well as the Verizon 3G/4G UML290. Here is what Peplink had to say about the recent updates: "Announced at the recent CommunicAsia event, the Peplink Balance 310 and Balance 210 feature 100Mbps throughput, USB modem support, and a four-port gigabit LAN switch. These new additions to the Peplink Balance lineup are housed in durable, attractive metallic enclosures, combining rugged good looks with high speed and easy connectivity. Perfect for branch office VPN bonding and Internet link load balancing, the Peplink Balance 310 and 210 raise the bar for SMB routers, offering unparalleled performance, reliability, and value." The Balance 310 and Balance 210 are both on sale now at 3Gstore. Need Sprint or Verizon 3G or 4G service, too? Save $20 off the Balance 310 or 210 when you're signing up for 2-year Sprint or Verizon service! In March, Verizon released the Novatel USB551L, which proved to be one of, if not the most reliable 3G/4G modems. However, there has been growing issues over the past few weeks regarding connectivity with the device in 4G areas, despite excellent 4G signals. At first this issue seemed to revolve around the newer NetBSD based routers, however, it seems customers on the older Ubicom platform are also experiencing problems now. We've been working directly with Cradlepoint to figure out a solution, but so far there hasn't been a lot of success. If you're experiencing issues with the Novatel USB551L and a Cradlepoint router please fill out the information requested from this thread to help us solve the problem - Cradlepoint issues with Novatel USB551L [success/failure]? “In a collaborative effort, Wilson Electronics and Verizon Wireless have agreed upon new technical specifications for consumer cellular boosters, which the two companies have filed jointly in response to the FCC’s signal booster NPRM. Wilson feels the joint proposal is a win-win for both consumers and cellular carriers. Boosters meeting new stricter design standards can ensure that private users as well as government agencies can continue to have reliable service in areas where signal coverage may not be optimal due to terrain or economics. The new standards will also ensure that carriers’ networks will be protected from cell site interference, which poorly built boosters might cause. “We commend the FCC and its Commissioners for understanding the value cellular signal boosters provide to the public, and the need that exists to have higher standards placed on booster manufacturers in order to prevent interference with the cellular networks. Wilson believes that its collaboration with Verizon Wireless was only possible because the regulatory framework for signal boosters was skillfully constructed by the Commission to evenly balance the interests of consumers, manufacturers and carriers. We mentioned last week that the popular Cradlepoint MBR1000 had reached "end of life" (along with 6 other Cradlepoint models), and today we sold our very last unit. The MBR1000 is now officially GONE from 3Gstore after over 3 years of being one of the number one products used by 3G and later 4G mobile broadband users. If you've been thinking of purchasing the MBR1000, fear not - there are a variety of other routers available, including the affordable Cradlepoint MBR95 and the powerful MBR1400. To view and compare ALL the available routers, use our Router Advisor. If you already own the MBR1000, you don't need to worry about owning an "outdated" product at this point - Cradlepoint is going to continue to support the MBR1000 for the immediate future (likely till next year). After that, though, there won't be any further firmware updates available for the MBR1000.